In a week in which the leader of the Palestinians publicly acknowledged that the Holocaust was the worst crime in modern history, in a week that includes Holocaust Day, it is all too easy to forget that the Holocaust was not 6 million Jews, or 10 million people in total, or whatever figure we can urge historians to agree upon, or ten thousand camps, or forty thousand camps, or whatever the tally ends up being. It was not, as it is so often reduced to, about the statistics. It was the story of individuals, caught in the jaws of an unthinkable machine. Every single person of those millions who was imprisoned, tortured or killed lived their own life, felt their own fear, recoiled in their own horror, experienced the pain of separation from their loved ones, and faced their own, and their loved ones, extermination. And despite the similarities, every single person endured a separate and unique experience. Individual by individual they were lined up by trenches and shot in the back of the head. Individual by individual, village by village, they were lined up against walls, sometimes clutching their families to them, shielding their children’s eyes from what was about to happen, and machine-gunned. In their millions, especially in Eastern Europe, but one by one, nevertheless. Turn your eyes, if you can, to the camps. Witness, as a sentient, feeling, frozen-with-fear child is thrown alive into a furnace. Now see child after child. One after another. See another child scalded with boiling water, or acid, or hideously burned, or egregiously wounded, so that “doctors” could “scientifically” monitor their pain and death. See a man, a woman, stood holding hands, someone else’s child clinging to their legs in terror, all naked, waiting for the gas to flood into the room, knowing what was coming because they had heard the screams of the men and women who went before them. Real people, one by one by one, lay on rickety wooden bunks, wracked by dysentery, cholera, typhoid … knowing that if their plight was noticed during a roll call they would be immediately sent to the gas, the bullet, to be buried alive, to be hung, to be strangled, or just to be left outside to freeze to death. They knew this every day. Watch it, if you can. 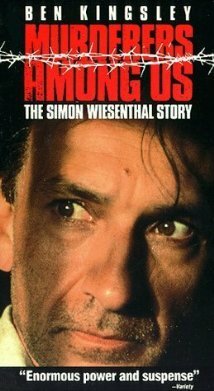 Many years ago, I watched a movie called “Murderers Among Us: The Simon Wiesenthal Story”, for which Ben Kingsley was nominated for a Golden Globe and for which he won a “Golden Camera” for Best Actor in Germany. I recommend it. Since I watched it, I have been unable to watch dramas or documentaries about the camps, not that I found it easy beforehand. I am not a moral or intellectual coward. I know what happened. I simply cannot bear to watch it over and over. It reduces me to abject misery. I sometimes wonder if past lives are real, and I was one of the victims. Or maybe I just have an enhanced capacity to imagine. I am a writer, after all. From amongst many tragic scenarios, it included, in particular, one scene that seared itself into my memory. It especially distresses me, even to this day. Wiesenthal had a friend who would always work without a coat, no matter how cold it was, smashing rocks feverishly, to show the Nazi guards how valuable he was, and thus avoid being selected for death. One day, a guard idly calls the man to him, and orders him to stand back-to-back with another prisoner, binding the two of them together with wire. He ignores the inmate’s protests as to his value, impatiently muttering, with no emotional recognition of the fact that in front of him stands two terrified human beings that he is about to kill, “Come on, come on. Hurry up.”, as he moves to put his gun into the prisoner’s mouth. It is as if it is somehow affronting to him that a man under his control could desire to live, not die. The Jews had become so reduced in his eyes, so non-human, that such concerns were merely annoying. He then shoots the two prisoners through the head, and turns to a fellow guard, triumphantly declaring he has found a way to save half the bullets they use. The scene emphasises that there was no way to avoid one’s fate. One died, or one didn’t, by sheer chance, and each time and always a person, an individual, with their own hopes and fears and love and terror, was the victim. Only when we individualise the statistics in our head do we start – falteringly, hesitantly – to grasp the real nightmare that was the Holocaust. Only when we try, however impossibly, to put ourselves in the places of those who died – and those who lived – to try and emotionally experience what they went through – can we possibly comprehend the depth of depravity and evil to which the Nazis stooped. Not to do so is to gradually allow the event – and all other such events before and since – to become mere statistics. The statistics, intended in their scale to shock us, ironically merely de-humanise the individuals concerned. Which is why I recommend you read this article by Emily Hauser, a warm-hearted, intellectual, humane, feeling Jewish writer, on what Holocaust Day provokes in her. Because we owe it to those who died to remember them, not as a mass, but one by one. And we owe it, as well, to those who may yet die, in some future burst of human insanity. We owe it to current generations, and future ones, to never forget. To let our memories infuse our understanding and our decision-making today. Please: click the link, and read. Even if it’s hard.